Speciality & Variety Acts | Book & Deal Directly With a Speciality Act Now! Variety Acts are making a big come back - they are cool, entertaining, unusual and captivating - ideal for a party that packs a surprise or unusual entertainment for a corporate event, booking some of our beguiling acts might fit the bill! For a decadent party, see the Contortionists, Hula Hoop Dancers and Sword Swallower's display their astonishing talents. How about the grace and power of an Aerialist performer, using body strength to climb ropes and perform elegant acrobatics high above the stage - throw in some state of the art LED lighting and you've got a psychedelic happening - great for venues with plenty of space! Book a Caricaturist to capture guests in quick quirky sketches, Silhouette Artists that will produce a true life-like outline of faces and Origami Artists for paper folding fun - all perfect to hire to add something special for your Wedding, Party or Corporate Event! For a special 18th or 21st Party, you can choose from muscle bound jugglers and stunt acts, nicely backed up by Fire Eaters. And young children will love the Diablo performers and Mono Wheel Artists as a change from the usual acts provided by Children's entertainers. Any event can be given a adrenalin shot of fun with our experienced Variety artistes so browse through the selection below and contact those acts that appeal to make a booking. Find a Speciality / Variety Act for hire near you in minutes! Option 1. Enter your event location below & contact a Speciality / Variety Act directly! Option 2. Request multiple quotes from available Speciality & Variety Acts Get Quotes! Option 3. Read information & advice on hiring Speciality & Variety Acts Read Advice! Finding the right Speciality Act is easy with our unique and comprehensive guide. Bursting with essential tips and answers to all those niggling questions, we help you book with confidence, so that you and your guests can relax and enjoy a truly fantastic and memorable event! - WHAT WILL A SPECIALITY ACT DO AT YOUR EVENT? - WHAT TYPE OF EVENTS ARE SPECIALITY ACTS HIRED FOR? - HOW MUCH DOES A SPECIALITY ACT COST TO HIRE? - HOW CAN I FIND AND BOOK A SPECIALITY ACT FOR AN EVENT NEAR ME? WHAT WILL A SPECIALITY ACT DO AT YOUR EVENT? That’s a good question! We feature a tremendous range of speciality acts, just waiting to bring the magic and vibrancy of the circus and street theatre to your event, including acrobats, aerialists, stilt walkers, contortionists, jugglers, fire performers and many more. These highly skilled artists, also referred to as circus or variety acts, combine circus, cabaret, dance, sport, gymnastics and street performance to create thrilling shows, full of dazzling tricks and daring routines, along with plenty of comedy and audience interaction to keep audiences engaged. Speciality acts are guaranteed to add a fun and colourful carnival vibe to any occasion. The Circus has undergone a complete transformation in recent decades, thanks to hugely successful and innovative companies such as Cirque du Soleil. Rather than the traditional ringmaster in a tent doing tricks with lions and tigers, contemporary circuses put on lavish and theatrical shows, using sophisticated lighting and effects and no performing animals. Speciality acts provide the ultimate wow factor, creating exhilarating entertainment and performing spectacular, death-defying stunts to add real drama to your event. WHAT TYPE OF EVENTS ARE SPECIALITY ACTS HIRED FOR? Speciality acts are hired for corporate events, exhibitions, trade shows, galas, fundraisers, weddings, parties and festivals. There is an astonishing array of acts to choose from that work both on stage, close-up and as walkabout entertainment. Give your outdoor event a festival vibe with a stilt walker or juggler, or delight a young soccer fan with a football freestyle act. An acrobat will add much needed pizzazz to an annual work conference, while a contortionist will bring an element of surprise and draw the crowds at a trade show or product launch. Light up the night sky at a wedding or birthday party with a fire performer and liven up a team building day with a hypnotist. Or how about an artistic entertainer? These amazing performers will transform any occasion, making it exciting, engaging and memorable. Read on to find out how to make the best of hiring a speciality act for your particular event. In order to choose from the vast range of acts available in this category, it’s a good idea to consider the type of event you’re holding, the age range of your guests, whether the venue is indoors or outdoors and whether you want a stage show or mix and mingle entertainers. You will also need to bear in mind the size of your venue and performance area and any particular restrictions that might affect certain act types. For example, aerialists will need sufficient ceiling height and you will need permission from your venue to have fire performers. Think about the type of act you’re considering and whether they are a practical option for your event. If in doubt, ask your chosen performer and they will be happy to advise. Acrobalance is a specialist performance including spectacular acrobatic lifts, gymnastics, somersaults and hand balancing. Combining balance, strength and flexibility, this art form is highly expressive and makes a definite impact, with seemingly impossible moves carried out with breathtaking style and control. Hire an Acrobalance or Adagio Act for your celebration and witness incredible stunts including dancers hoisted into the air whilst being balanced on just one hand, or being flung around in a whirl! If you’re looking to liven up a corporate event, Christmas party or leaving do, this captivating circus-themed act with music and colourful costumes, makes for a truly thrilling show, which will give staff plenty to talk about and serve as a fantastic ice-breaker for colleagues who may not get the chance to chat at work. If you’re planning a trade show or product launch, you’re going to want entertainment that draws a crowd. Acrobalance acts can perform to music that will suit your product and will put on an enthralling show that audiences of any age will enjoy, either as a stage spectacle, or as walkabout entertainment where the audience watch their amazing moves up close. Acrobalance Acts usually consist of two dancers, but troupes can include up to ten or more performers. They can set up to perform in a shopping centre, a shop (providing there’s enough space) or at most kinds of venues or exhibition spaces. Performances are usually accompanied by background music and can be a focal point, or something your guests can enjoy while they continue talking and mingling. They are also highly adaptable and can tailor their costumes, music and choreography to fit any theme, whether it’s 1940s jazz or Halloween! To hire an Acrobalance & Adagio act, browse through our profiles, take a look at what kind of events our acts have previously performed at, check out their video clips and testimonials and use the contact form to ask any questions or request a free, no-obligation quote.. The ultimate in dramatic entertainment with an authentic circus theme, aerialists and acrobats are renowned for thrilling audiences with high-energy, tightly choreographed routines. These elegant and gravity-defying displays require great gymnastic skill, with a combination of strength, flexibility, balance and stamina. Aerial artists perform high in the air which makes them perfect for larger venues. They use a variety of apparatus including trapezes, hoops, rope swings and silks (ribbons) and will leave your guests breathless as jaw-dropping moves are performed before their very eyes. Available to book as solo acts, duos or groups, these performers can tailor their shows to suit your event, either putting on a stage show or providing a mesmerising backdrop that guests can enjoy as they move around and mingle. If you need to stick to the ground, opt for a floor-based Acrobat, who will perform gymnastics and daring stunts without the need for being held in the air. Many acrobats offer several disciplines, performing floor gymnastics, hand balancing, hula hoop and contortion, or a mix of all of these. Caricaturists are extremely talented artists who can sketch people at high speed, exaggerating features such as the eyes, nose, mouth and hair to great comic effect. They work fast, completing portraits in a matter of minutes, with some offering a specified number of pictures per hour (although the more time they take, the more detailed the pictures will be). 10-15 caricatures per hour is typical, so consider your number of guests to ensure there’s enough time for everyone to be drawn (bearing in mind that no caricaturist will be able to draw 100 guests without going cross-eyed). Portraits are usually A4 or A3 size and can be in black and white or colour. You can also hire a digital caricaturist who will use the latest generation equipment, allowing pictures to be emailed and shared on social media! Imagine the laughter ringing out as colleagues, friends or family members show each other cartoon portraits that show them in a whole new light! Even better, guests can take their caricatures home as a keepsake. A Caricaturist can either work around the room, drawing while standing, or be seated in one location. The latter is ideal, as it’s more relaxing for the person being drawn, easier for the artist and allows other guests to watch the portrait taking shape. Guests of all ages will love being drawn by a Caricaturist. You can also hire a Caricaturist to create drawings from photographs, for a group photo, event poster or personalised wedding invitation. This is a great way to avoid the usual format and create a sense of fun ahead of your big day. Caricature Artists in London are increasing popular at weddings to capture couples and guests during the day. Caricaturists are very popular at trade fairs and product launches, where they are guaranteed to draw a crowd. Portraits can even be drawn on your company’s branded paper, giving customers a treasured memento to take home that also displays your logo! A good caricaturist is not only a talented artist, but also a natural entertainer, knowing how to put people at ease while they’re being drawn and telling the odd amusing story to keep guests entertained. This makes them perfect for birthday parties, fun days, weddings, award ceremonies and work celebrations. Our Caricaturists each have their own style, with some drawing in a definite comic style and others taking a more flattering approach! You can view samples of their work on their profiles to make sure they will be the right fit for your event. Contortion, or contortionism involves using extreme flexibility to squeeze into tiny spaces or twist the body into unnatural and seemingly impossible positions as part of a choreographed set of poses. This is a unique and elegant art from, combining gymnastics, dance and yoga. It takes a great deal of skill and years of training to perfect, and is fascinating to watch. Performers fit into three main categories; front benders, back benders and, on the more extreme end of the spectrum, dislocation acts. By far the most common are the back benders, who flex their spines backwards to wrap their feet behind their head, walk on their hands or lie on their chest bending their legs backwards until their toes touch the ground in front of them. This is great birthday party entertainment and would be a dream for any young dance or gymnastics fans. It’s also perfect if you’re looking for something a bit freaky for a Halloween party! If you’re hosting a product launch, sporting or VIP occasion, and you want edgy, eye-catching entertainment that’s sure to impress your guests, this is an ideal option. Of course, it also fits perfectly with any festival, fun day or circus-themed event. Equally, if you require sideshow entertainment, that works with or without music, a contortionist can perform without detracting too much from your actual event. Contortionists usually perform solo, with accompaniment in the form of backing tracks. If you have any special requests regarding the style of music or costume, speak to your chosen performer. They will be super adaptable, as well as very bendy! These extraordinary performers will astound your guests with their incredible moves, and keep everyone talking long after your event has ended, so for an event with a difference, hire one of our fabulous Contortionists. All the information you need will be on their profiles, including video clips of them performing, and you can use the contact form to ask any questions you have. With only a large ring made of metal, Cyr Wheel Acts offer breathtaking performances combining strength, balance and dancing skill. Standing inside the ring, they flip, spin, rotate and create seamless balletic moves that are truly mesmerising to watch and guaranteed to impress audiences of all ages. These highly trained artists demonstrate incredible control, as they dance and weave in and out of the wheel, which never stops moving. This is perfect entertainment for events with an industrial theme, or any occasion needing a stunning visual display. If you want to add the wow factor to an exhibition, product launch or gala dinner, a Cyr Wheel Act is the ideal solution and performances can be tailored to incorporate brand designs and logos! Take a look at our talented Cyr Wheel Acts available to hire either as a solo act or a group of performers. On their profiles you will find details of their experience, video clips, testimonials and a form for contacting any acts you like. 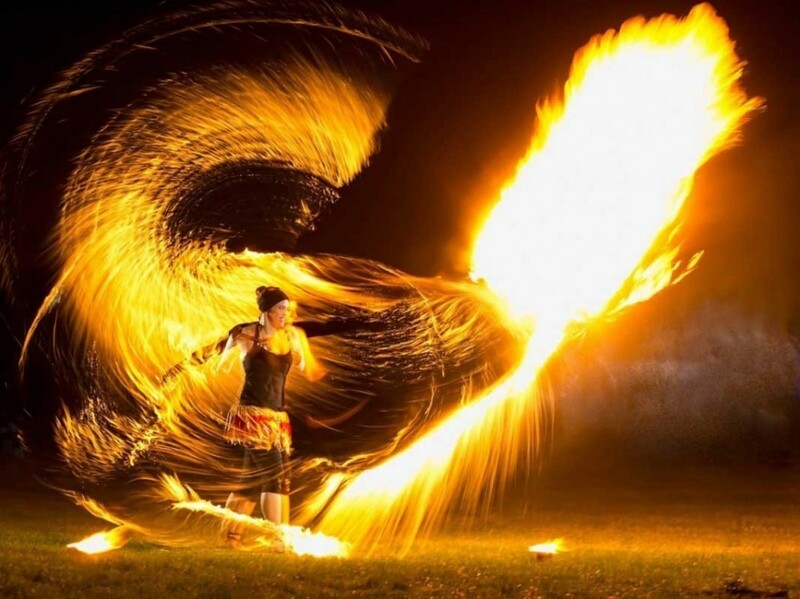 If you’re looking for thrilling, daredevil entertainment including juggling with batons and circles of fire, fire spinning, fire breathing and fire eating, hire a Fire Performer! This circus-themed act dates all the way back to the Ancient Aztecs but its enormous popularity endures to this day. Guests of all ages will be kept in suspense as performers dance and spin in routines that are often choreographed to music. They can perform on stage or with a group gathered round them, providing exciting, carnival-style walkabout entertainment. Either way, these incredible performers add dramatic visual impact, all the more effective after dark. Booking a fire performer is certain to bring a major wow factor to your event. Perfect for any festival, community or circus-themed event, corporate celebration or company incentive day, our thrill-seeking Fire Performers will also attract customers at a product launch or trade show, especially with Fire Poi, where balls and ropes of fire are spun around, or with fire fans that draw exciting pictures in the air. Or how about Sparkle Poi, that creates curtains of lights, fire hoops and even coloured fire that can be tailored to your corporate colours. If your event is indoors, just make sure the venue will allow performance with fire. For more on the practicalities of booking a speciality act, see our Essential Tips below. At some stage in our lives, we’ve all tried hula hooping, but let’s face it, after a few ho-hum swings around the waist, the hula hoop usually falls flat on the floor. Well, fear not, a professional Hula Hoop Act will put on a show that is truly sensational to watch. Combining flexibility, rhythm and acrobatics, a hula hoop performer will keep guests captivated as they perform astonishing routines, usually to music. Thanks to shows such as Britain’s Got Talent showcasing modern hula hoop acts, the art of hula hooping has undergone something of a resurgence in recent years and is something that will appeal to young and old. A Hula Hoop Act will perform a contemporary show for your guests, beginning with spinning the hula hoop around their waist, then moving it down to their feet and up to their neck, at ferocious speed. Guests will be amazed as they introduce more and more hoops and spin them simultaneously on different parts of the body! For a fun and dynamic act, that will add a colourful and interesting visual element to your event, check out our talented Hula Hoop Performers. They are perfect to book for store promotions, exhibitions, drinks receptions, birthday parties and of course, any occasion event with a circus or burlesque theme. Looking for some something completely different? Hiring a Hypnotist, if you’re brave enough, it a sure fire way to ensure that your event is one that you and your guests will never forget! Hypnotism today is a fast-paced, highly interactive form of entertainment that’s really exciting to watch. While some might find Hypnosis a bit controversial, there really is nothing to be afraid of. No one can be hypnotised against their will and no one is made to act in a way that is out of character, or that would cause genuine shame or embarrassment. The object of the exercise is to have fun and put on a show for the enjoyment of everyone involved. Some of our UK Hypnotists are even members of the government recognised body, the Federation of Ethical Stage Hypnotists, or F.E.S.H. Audience interaction is the name of the game, along with a large dose of comedy. Imagine guests falling about, helpless with laughter as hypnotised friends or colleagues find out they’ve won the lottery, get chased by ghosts, or star in the cast of Riverdance! Booking a Hypnotist is a popular choice for stag dos and military functions, as well as anniversaries, engagement parties and birthdays where the guest of honour is the star of the show. They are also particularly well suited to team building days. Whatever the event, a hypnotist can tailor their show to incorporate a theme, or include comedy and tricks that reflect the occasion. The only caveat is that you will need some willing volunteers among your guests. A professional hypnotist may have amazing mind control abilities but they only use their powers of persuasion for good. So, for a tasteful yet fascinating and utterly memorable event, check out our Hypnotists and find a performer near you. Mention the circus and most people think of Jugglers. Indeed, they are one of the most popular speciality acts available to hire, partly due to their sheer flexibility, making them suitable for a wide variety of events. Jugglers incorporate a lot of comedy into their acts, providing dynamic shows that will entertain guests of all ages at festivals and street parties, wedding receptions and birthday parties. Jugglers are skilled individuals who have trained long and hard to master their art. They juggle a variety of props, including plates, colourful batons, hoops and balls and for more daring stunts, knives and fire torches! Planning a celebration, outdoor party, corporate event or carnival-themed entertainment? Or are you looking for great walkabout or mix-and-mingle entertainment, where guests can get involved and even learn some basic circus skills? Then look no further, book one of our talented jugglers who will be the perfect act. Similar to Jugglers are Diabolo acts, who perform a large variety of tricks using hourglass shaped cups, derived from the Chinese yo-yo. The performer spins the cups on a string which is attached to batons that he or she holds. This is a lot of fun to watch and children would enjoy learning some of the more basic tricks. Foot Jugglers are performers who lie on their backs on chairs and juggle and spin balls, hoops and even tables and chairs with their feet! This makes regular juggling look like a walk in the park and is perfect if you’re looking for show-stopping entertainment for guests at a festival, cabaret show, birthday party of corporate function. LED stands for light-emitting diode, a semiconductor that produces light as a result of moving electrons. Although tiny, LEDs produce a lot of light, without burning out or getting hot. Many forms of lighting are now being replaced with LEDs and they have had a big impact in the entertainment industry, with lots of performers now using LEDs to visually enhance their shows. Powerful LED lights fitted inside costumes, instruments and props, controlled wirelessly by tiny computer processors, provide endless possibilities. Artists can now create original, hi-tech light shows using sophisticated visual effects and displaying high-resolution images for a totally immersive experience. Hula hoops, dance props, inflatable beach balls, robot costumes, instruments, spinning pois and juggling clubs are just some of the objects that come to life with LED technology. Do you want to provide your clients with a cutting-edge artistic experience? Logos, words, graphics, themes and images can be uploaded onto interactive video screens and colourful, glowing props, which are then used in choreographed shows, perfect for promotional events and advertising. You can even go ultra hi-tech and have small video screens incorporated into the costumes of performers! Big companies including YouTube, Google and Coca Cola have all used LED entertainment, putting on spectacular shows, tailored to their brand. Equally you can electrify the audience at a trade show or product launch with an LED instrumentalist. People will not be able to take their eyes off the musician, as their violin, saxophone or guitar lights up in beautiful glowing colours that change in time to the music as they play! Add sparkle to a drinks reception, party or festival with glowing spinning poi that draw beautiful patterns as they trail light through the air. Stunning visual displays and elaborate dance moves will impress audiences of all ages and are a fantastic option if your event is indoors and you’re not able to hire an actual fire performer. Dazzle guests young and old at a summer fair or holiday resort with a neon dance performance or glow in the dark laser show, or add a futuristic flavour to a nightclub event with a light up band. The dance floor will be fuller than you’ve ever seen it. You can also hire LED entertainers to perform on podiums, on stage or as mix and mingle entertainers, interacting with guests and creating an exciting party mood. For a magical, carnival-style vibe at a summer fair or street party, you can have LED drummers parading in costumes that change colour in time with their choreographed moves. Audience members can get up close to the performers and interact, maybe even get a photo taken with them! LED shows are ideal for themed events such as Halloween, Christmas or New Year’s Eve as well as birthdays, festivals, staff events and parties of all kinds, adding excitement, colour and something that guests will not be expecting. You can also opt for lights that create a more relaxed and mellow atmosphere if required, for a sophisticated drinks reception, cocktail party or VIP occasion. One thing to bear in mind is that LEDs are designed to glow in the dark and are most effective in the evening or at night, or in venues with the lights turned right down. With so many amazing LED performance options to choose and book, why not take a look at the profiles of our LED Entertainers and see what they offer! Essentially, Ventriloquists are performers who are able to speak without moving their lips, although there is a bit more to it than that. They perform with puppets (known as dummies) that they manipulate and interact with on stage, using different voices so that the puppets appear to be talking. Puppets are created with a lot of skill and artistic flair, to bring about strong, believable characters and lots of laughs. When you watch skilled ventriloquists, you suspend your disbelief and accept the dummy as a separate entity. Routines are comedy-based, with the dummy often telling the jokes and keeping one step ahead of the ventriloquist. Ventriloquists can be thin on the ground compared to other kinds of entertainer, for the sole reason that ventriloquism is really difficult and not many people can do it! Nevertheless, it is very much back in fashion thanks to the recent emergence of a number of high profile performers so finding and booking a ventriloquist has become easier. Acts can be family-friendly or more adult-oriented and styles vary. Terry Fators, one of America’s top ventriloquists, performs brilliant impressions of rock and pop stars singing their greatest hits - without moving his lips! UK artist and Live at the Apollo regular Nina Conti is a mistress of comedy ad-libbing and audience interaction and always had her audience in stitches. A Ventriloquist will bring delightful and engaging comedy and entertainment to a birthday party (for children or adults), family fun day or comedy show. To find the perfect performer for your event, check out our Ventriloquists. On their profiles you will find plenty of details about their shows, where they’ve performed, the type of events they cater to, along with video clips and testimonials. Some of our acts are also members of the International Ventriloquist Society, who have a great website for anyone interested in learning more about ventriloquism. Organising a birthday party for a young football fan? You can’t do better than hiring a Football Freestyle Act. They will go down a storm as they dribble, spin, kick, catch, juggle, balance and bounce the ball, demonstrating impressive technique. Routines can be performed to music but this is not a requirement. Football freestylers provide engaging, interactive entertainment, and are usually more than happy to get everyone involved and teach a few of their moves. They are a popular choice of entertainment for events at football clubs, corporate sports functions, promotional events and product launches. Check out our dazzling Football Freestyle Acts, many of whom have performed for the big brands. Shadow theatre consists of artists creating shapes with their hands and bodies that are projected in silhouette onto screens that are painted or lit with atmospheric backgrounds. This creates a visually magnificent and dynamic show, incorporating physical theatre, music, colour and stories, that will appeal to audiences of all ages. While many Hand Shadow Acts are aimed at young children, this type of act can also work brilliantly at corporate events, where the music, colours, designs and backdrops can be customised to compliment your brand perfectly. Enjoy watching human characters, celebrities, animals and even houses, cars, bicycles, trees and flowers form as the actors cleverly bend and blend their bodies into different shapes, telling fascinating stories full of drama and colour. Hand shadow acts are usually performed by a duo or a group of actors. Take a look at our magical Hand Shadow Acts to find and book a performer near you. To add the thrill of real street theatre to your event, why not hire a Human Statue? Also known as living statues, these street artists pose as statues or mannequins, with highly realistic make-up and costumes, standing completely still for long periods, occasionally moving or jumping up to surprise unsuspecting passersby! You will find human statues at busy tourist spots, such as Covent Garden in London, or on the Pont des Arts in Paris. They come in an enormous array of characters. You can hire a medieval knight with real armour and props, or a classic Roman statue, made up in stone or marble effect and wearing long, flowing robes. You can choose a Victorian or Edwardian character, or even a particular historical figure. Imagine having your photo taken with Admiral Nelson or Abraham Lincoln! There are statues painted in gold, silver or bronze. There are human statues adorned with Christmas decorations or dressed as the Easter bunny. There are ice kings and queens perfect for a winter theme. There are floating, levitating, robotic and breakdancing statues. From Mickey Mouse to Michael Jackson, the choice is endless! Booking a Human Statueis a fantastic idea for any themed event or corporate function. They can hand out leaflets and even customise their costumes to incorporate your brand colours and logo. They provide entertainment with a strong visual impact without detracting too much from your actual event, or any other entertainment going on at the same time. The Mirror Man Act is a human statue whose costume is completely covered in tiny mirrors. This fantastic visual has proved to be consistently captivating for audiences and will suit any event, from a work party, charity event or conference, to fete or festival entertainment. The classic Mirror Man outfit consists of a suit, with top hat, glasses and walking stick. However, the costume can be changed to suit the theme of your event. Mirror Men work well as ornamental or mix and mingle performers, walking among guests, causing a stir and stopping for photos as they make their way from group to group. A mirror man will work wonderfully as indoor entertainment, especially where there are bright or colourful lights that will be reflected in the the mirrors. Many mirror men and women also perform magic or circus-style routines, so speak to your entertainer and find out what they can offer. For truly eye-catching entertainment, hire a mirror man to entertain crowds at a trade show or product launch or brighten up a dull conference room. Bring some shimmer and shine to your party, or add a bit of extra va-va-voom to a club night, by having a mirror performer dancing on a podium, boogying among the guests or even leading a few routines on the dance floor! This will be fun and intriguing entertainment and a guaranteed ice-breaker. Whatever the occasion, a Mirror Act is sure to dazzle! No street party or festival is complete without a stilt walker, taking giant but elegant steps as they move around several feet above everyone else and wearing brightly coloured costumes, often juggling or balloon modelling as they go. Stilt Walkers are great for handing out flyers and providing roving entertainment at a trade show or other promotional event, where they are sure to capture people’s attention. This is an act enjoyed by children, families and people of all ages and a popular form of entertainment for parades, street parties, carnivals, garden parties and nightclub events. Are swords designed to be swallowed? No. Is it dangerous to swallow them? Yes! This art form dates back over 2000 years but is every bit as terrifying to behold as it always was. You will not be able to take your eyes off this performer as they taunt and tease, building unbearable suspense as they prepare to pass one, or possibly more, swords into their throat and down their gullet, holding them there for a bit longer each time. Yes, this is as dangerous as it sounds so please don’t try it at home! Professional sword swallowers train for years in order to develop the skill required to perform their act safely, but it’s still pretty nail-biting stuff. Not for the faint-hearted but definitely thrilling! And if swallowing swords wasn’t enough, these acts often perform other tricks and stunts, most of which are even more gruesome, so if your guests are on the sensitive side, you might want to give this one a miss! If the previous acts are just not exciting enough for you, then there’s nothing left but the most extreme form of entertainment we can think of. Enter the most daring (or insane) performers on the planet. If you enjoy watching your entertainers fire crossbows, juggle knives, get buried alive or scale tall buildings, this is the show for you. Stunt tricks are dangerous, no question about it, but rest assured, these artists have the training and skill required to carry out their extraordinary feats with minimal risk to themselves (and of course the audience). Some stunt shows require large venues and special equipment, others will work in your back garden. From high-flying trampoline acts to extreme skateboarders, the variety is endless. Bike fans will adore a show featuring gravity-defying BMX or motorbike stunts. For exciting entertainment at a birthday party, thrill guests with a martial arts routine, ninja display, acrobatic sword swallower or fire eater. Build some hype around your brand event with a show that’s sure to draw the crowds and create a buzz. For an exhibition with a difference, book a stunt performer who will impress your clients, giving them an unforgettable live experience. From human cannonballs to high-voltage magic, the mayhem never ends, so give your guests the adrenaline rush of their lives with one of our amazing Stunt Shows. Still not found what you’re looking for? Check out these weird and wonderful variety & speciality acts available to book and find the perfect circus-themed or unusual entertainment to bring your event to life. Looking for something alternative and exciting when it comes to your wedding entertainment? How about the thrill of an aerialist or acrobalance act flying through the air? These acts will bring magic and excitement to your wedding breakfast or reception and perform to your choice of music. Stilt Walkers and Jugglers are particularly suitable for outdoor weddings and provide a colourful, festival vibe, performing tricks and mingling with guests. Children will love these enchanting walkabout entertainers and hiring this kind of act will help to make them feel more involved in the celebrations. Hiring a Caricaturist is a fantastic way to liven up your wedding breakfast. The artist will draw attention from across the room and there will be plenty of giggles as cartoon portraits of friends and family come to life. Guests will be strangely proud of their pictures, exaggerated features and all, and will love holding on to them as special keepsakes. Caricaturists are friendly, professional entertainers who will put guests at ease and even tell the odd entertaining anecdote as they draw. Imagine the faces of friends and family light up as evening falls and they are treated to a Fire Poi show, with spinning balls and ropes of fire lighting up the night air. Or how about Sparkle Poi, creating curtains of lights, fire hoops and even coloured fire that can be tailored to your wedding colour scheme! If you fancy going a bit hi-tech, you can hire an LED Entertainer or Dancer for your drinks reception, bringing you a totally unique show which will elevate your evening entertainment into a night of colourful fun. An LED performer can set up on stage and perform solo, giving your guests a focal point, or you can have a group of dancers put on a choreographed show to your special choice of music. LED Entertainers can also provide walkabout entertainment, bringing fun and adding a great talking point as they move from group to group. You could even hire an LED Musician to perform along to your chosen set list, adding energy and a sparkling visual as their instrument glows in electrifying blues, glistening purples, intense reds and glittering greens. The performer may even light up themselves! For a dazzling addition to your evening party, you can hire a Mirror Man. They will get their costume ready backstage and then make a dramatic entrance, surprising guests with a classic, funny and artistic act, including plenty of crowd participation. They can act as a human statue, mix and mingle with guests or even perform alongside any musical entertainment you have booked. This is a wonderful ice-breaker and great for photo opportunities, giving your guests a special memento of your big day. For the thrill-seekers among you, there is the option of hiring a Fire Performer, Sword Swallower or Stunt Show to electrify your celebrations and have guests on the edge of their seats. Whatever kind of wedding you have in mind, there are speciality acts to bring your dreams to life and make your perfect day one that your friends and family will never forget. HOW MUCH DOES A speciality act COST TO HIRE? Prices vary widely from act to act, so check out individual profiles or ask your chosen entertainer for a quote. They may be able to offer a discount depending on the event and their schedule at the time. Costs also vary depending on the number of performers you hire, travel time to your venue and set-up requirements. Like most entertainers, Speciality Acts tend to charge more at key times of year such as Christmas and New Year’s Eve. Our entertainers’ directory is the perfect tool to help you find the right Speciality Act for your budget. You can easily search for the best acts in your area and message them directly. Some acts even include a rough price guide in their profile. Since prices do vary widely, depending on the act and the event, we highly recommend getting in touch with your chosen performer for a completely free, no-obligation quote. Most circus performers prefer short, attention-grabbing performances that keep the audience engaged and involved throughout. For longer shows, they may bring additional performers. Many will be happy to provide short sets throughout the day or evening if your celebrations are continuing, or longer sets for mix and mingle entertainment. If your budget allows, it can make sense to hire several circus-style acts for your event as together they will create that real festival vibe and your entertainment will be varied and keep people interested. You can always ask your entertainer to advise on timings for your particular event and they will do their best to accommodate your requests. Caricaturist: 3 hours (with a short break every hour) . The beauty of street performers is that they often require very little by way of electrical equipment, lighting and special effects. With only brightly coloured costumes, props and their own talent, they can provide attention-grabbing entertainment just about anywhere. Circus acts will generally bring their own props and equipment, but this will most likely not include PA system or lighting. If these are required, we advise checking with your performer when you book, as you or the venue may need to provide them. Most floor-based acrobalance acts require a minimum performance area of 2.5m x 2.5m, with a dry floor, no tables and chairs and free from clutter. Minimum required ceiling height is usually 4-5m. Trapeze acts will need 6m x 3m floor space and minimum ceiling height of 7m. Podium acts use podiums of 1.8m diameter and 1m high. Aerialists may bring their own portable, free standing rig or use existing rigging or ceiling hooks. Minimum floor space is usually around 2.5m x 2.5m but this will be more for some acts. Minimum ceiling height will usually be around 5-9m but again, this may vary. Even the most basic aerial acts may require rigging points with a minimum working load limit (WLL) of 500kg. However, aerial acts vary enormously in the type of equipment and set-up they require, so you will need to get a full list of technical specifications from your act. Only fully-trained and experienced riggers should be used and top level aerial acts will have their own. Most floor-based acrobatic acts require a minimum performance area of 2.5m x 2.5m, with a dry floor, no tables and chairs and free from clutter. Minimum required ceiling height is usually 4-5m. Artists will supply all of their own easel and drawing supplies and may just need a couple of chairs and possibly a table. They will only require room for two people to sit down, with about a metre in between. The space should be well lit. If you would like your caricaturist to draw on branded or headed paper, it’s best to check with the artist before ordering the paper, to ensure it’s the right size, weight and quality. Contortionists offering walkabout entertainment, performing floorwork as they move around, won’t require a stage. For a stage show with basic contortion, a minimum stage size would be 3m x 2.5m. For podium contortion a raised pedestal/podium of 1-2m diameter is generally used. Some acts can provide their own if required but clarify this when you book. Acts may request a warm room in order to stretch before performing. Music may sometimes be provided on CD or iPod but check this in advance with your performer. Minimum floor space required is 4.5m x 4.5m. Fire shows work best after dark but low-level lighting may still be required so that performers can see and be seen. Ask your performer about safety lighting, floodlights or dimming of existing lights. Performers will generally mark out their performance area when outside. If performing inside they will require an area of clear ceiling (with no hanging lights or other fittings) of at least 4m. The floor must be clean and uncarpeted, all furniture removed, and the area must be properly ventilated. The audience should be kept at least 2 metres from the performers and there must be a good supply of water available nearby. You should also get permission from the venue to have a fire act perform on the premises and any stipulations regarding fuel storage, space requirements and safety equipment should be observed. The venue will ideally have a fire steward or safety officer present and emergency procedures in place in case of a fire incident. Hypnotists require a fair sized stage in order to perform comfortably. Participants will need chairs to sit on, either in a row facing the audience or in a circle and they will also be standing up and moving around during the hypnosis routines. For a standard show with 8-10 participants, an area of 6m x 3m should be sufficient. As always, ask your performer how much space they will need for your show. Minimum performance area: 2m x 2m. Minimum ceiling height: 3.5 metres (the higher the better). Unless this is an LED or fire juggler, there will be minimal set-up requirements. LED entertainment works best in the dark but check what level of low lighting (if any) your performers require in order to see and be seen. Stage size requirements will vary according to the nature and size of the show. 8ft x 6ft (2.5m x 2m) would be sufficient for a solo LED musician, not including PA system. Dancers or troupes will need more space. If custom artwork is required, this will need to be requested in advance, usually at least 10 days prior to your event. The artist will usually need this in JPEG, PDF, GIF or EPS format. LED acts may need basic information about the venue, such as stage size and power supply in order to plan the best possible performance. These performers will provide their own puppets or dummies. They often use a PA system and may need a high chair on which to place the dummy. As ventriloquists often have several puppets, they may need a trunk or curtained area in which to keep them. If in doubt, check with your chosen performer when you book. These performers are very flexible and can perform in a back garden or forecourt as well as stadiums, exhibition halls and shopping centres and will tailor their show to suit your event. Outdoors is best, unless you’re using a sports hall or gym. They will provide their own balls. Performers will provide the screen, projector, black drapes to conceal the stage area and temporary flooring to go over the stage. Full shadow theatre shows with a group of actors will need a minimum stage area of 6m x 6m and 3.5m ceiling height. Technical set-up will take around 45 minutes. Sound and lighting set-up may take up to an hour and a half. Minimum stage size of 2m x 2m (sufficient space for podium). If the venue is large and the act uses music, they may require lighting and/or a PA system. Check this before booking. Minimum stage size of 2m x 2m (sufficient space for a rotating podium). If the venue is large and the act uses music, they may require lighting and/or a PA system. Check this before booking. For safety, the ground should be dry or non-slip and reasonably level and there should be a minimum of 4 metres overhead clearance. A dressing room with same level or lift access to performance areas is ideal, and an area the height of a wheelie bin (or a chair on a table) on which to sit and put on the stilts. Stilt walkers can duck under doorways, travel in lifts and walk short distances in lower clearance areas or up and down slopes, if necessary to get to and from the performance area. 30 minute set up time. Minimum stage size 2m x 2m. This act does not need a large amount of space in which to perform, other than space for the performer and a table for equipment and swords. If they are putting on a stage show with lighting, special effects and performing multiple stunts, they will need more space. A cabaret style show including routines such as sword swallowing and knife throwing will need at least 30 minutes set up time, a minimum stage size of 3m x 5m and a minimum ceiling height of 3m. The audience should be at least 2m away. Larger events with bigger props will need more space and stunts using cars or bikes will need suitable outdoor venues. Stage and set up requirements will vary hugely depending on the nature, size and complexity of the show. We advise speaking with your chosen stunt performer before booking to ask them what they require in terms of performance area size, floor surface, power supply and lighting. Many performers will come in a car or van, so make sure they have a reserved parking space as close to the performance area as possible, so that they can load and unload easily. For events in busy town centres, performers will appreciate you letting them know where the nearest available parking spaces are or where public car parks are located. We recommend appointing someone to meet your performers on arrival, to make sure they are able to unload easily, show them where the dressing room and toilets are and assist with any issues. If you are hiring multiple performers for a festival or summer fair, it’s advisable to have a designated area or office where you can meet and brief them and where they can go to report any issues that arise on the day. It’s also useful to meet them in advance, to run through the times and locations etc. Performers will need a private room away from the guests, ideally with good lighting and a mirror, in which to get changed, warm up and relax in between sets. A small, lockable room or back office may be sufficient if there is not a custom-made dressing room available. Bear in mind that not all performers will be willing to share a dressing room with other acts, particularly if they have not met before. Bathroom facilities should also be provided. Circus-style acts tend to be very physically demanding and performers are likely to be hot and sweaty by the end of the show and want to shower. Some may also need to wash off special make-up or body paint. Circus acts use a lot of energy when they perform, so ensure they have easy access to soft drinks and water free of charge. Performers will not expect alcoholic drinks to be included. A ready supply of snacks and sandwiches will also keep hard working performers fuelled during what can be a long day. This can be set up in a designated area or as a running tab at the bar. Whatever kind of performer you have hired, soft drinks, water, tea and coffee should be available, and if they are with you all day, a proper meal should be provided and a quiet place to eat, away from the public and guests. These will usually be included in the quote you are given, as the entertainer will need to calculate their travel costs, especially if they are travelling some distance. Thankfully this rarely happens, but in the unlikely event that, due to illness or other unforeseen circumstances, a speciality act is unable to perform for you as agreed, they will usually have a contingency plan. This means they can send a similar performer or act in their place, at no extra cost to you. For confirmation of this, you can check the Terms and Conditions in your contract. If you are in the unlucky position of having to cancel your event, there will be a cancellation fee. The amount usually increases the closer it gets to the event date. For example, cancelling 90 days before the event might incur 75% of the overall fee, while cancelling less than 30 days prior might mean paying the entire sum. Insurance is particularly important for speciality acts, as they include some high-risk activities. Ideally, the venue and the act you hire will have Public Liability Insurance. This covers you and them in the event of a claim, should any performers, members of the public or guests be injured at your event, or any damage be caused to property. For acts using fire, pyrotechnics and other potentially dangerous elements, you may need to produce a copy of performer’s risk assessment and public liability insurance. You might also have to provide additional fire safety equipment - ask your performer about this. Always make sure the venue is aware of the type of act you are hiring, just in case the venue need to do a risk assessment on health and safety or fire safety issues. When it comes to practicalities, it’s always better to discuss them in advance, to avoid any unexpected hitches on the day. Technical issues are central when hiring many speciality acts, so don’t be shy. Make sure you and your performer are clear on what is required. Good communication is the key to planning a great event. Booking a Speciality Act is easy with Entertainers Worldwide. You can search through different acts, view their profiles and read their all-important reviews. Some of our listed acts also include video samples of their performances. How can I find and book a speciality act for an event near me? Using Entertainers Worldwide, you can search and browse hundreds of types of Speciality Acts! Search now to find a Speciality Act for your event or Request Multiple Quotes from a selection of Tribute Acts - complete this form - this is a free service.